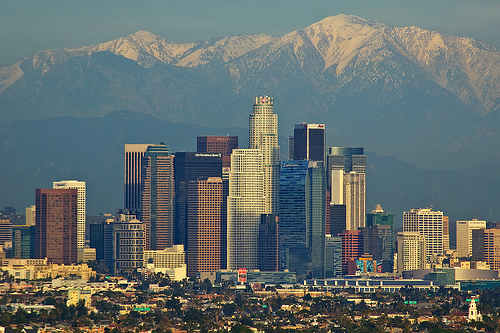 Spanning across 500 square miles of Southern California, Los Angeles is the second most populous city in the United States with a 2010 census population of just under 3.8 million people. According to the 2010 census, the city’s population is 50% white, 10% black, and 15% Asian. Just under 50% of Los Angeles' population is Hispanic or Latino. Spurred in part by rampant urban sprawl and gentrification in some neighborhoods, Los Angeles has spawned a wide range of community wealth building initiatives that are seeking to counter these trends. Not only is Los Angeles home to some of the nation's leading community development corporations, but it is also known for innovation in other areas, including university-community partnerships, community benefit agreements, and transit-oriented development. Organized labor has played a major role in community wealth building in Los Angeles. Although unions are losing strength and membership in much of the country, they have gained ground in Los Angeles. A city that has had a strong anti-union history and unions that traditionally excluded racial minorities has been transformed into a local labor movement in which Latino activists have often played a leading role and which has placed much greater emphasis on working in coalition with community-based groups. One sign of this is the work of the Los Angeles Alliance for a New Economy (LAANE). Founded in 1993, LAANE has helped spearhead national efforts to develop community benefit agreements. A Community Benefit Agreement (CBA) is an agreement between a developer and a coalition of community groups and unions that generates mutual cooperation instead of conflict, benefiting members of the community. Businesses, which often receive tax breaks, subsidies and other incentives to operate within a city, now share some responsibility for the surrounding community. Through a CBA, they may be required to provide living wage jobs, local hiring, affordable housing, housing for displaced families, and/or park space. In exchange for making these concessions, businesses gain expedited approval of their projects, lowering development costs. LAANE has been at the forefront of this movement, successfully working to negotiate a $500-million CBA that provides for the community around Los Angeles International Airport (LAX) during new construction projects. Another development, helping to change the direction of the city, was the passage of two important transit oriented development propositions -- Los Angeles County measure R and the California statewide proposition 1A in November 2008. The city, well known for its constant gridlock, has shifted increasing resources into transit in the past two decades. Measure R is a half-cent sales tax increase that is expected to provide the resources necessary to finance local transportation projects, including an extension of the subway toward the Westside, light-rail extensions through the San Gabriel Valley, dedicated busways in the San Fernando Valley and a host of highway improvements. Over the next 30 years, this tax increase is projected to generate $40 billion for congestion relief. Another large transportation project, partially funded by Measure 1A, allows the State of California to issue $10 billion in bonds in order to help finance a bullet train from Los Angeles to San Francisco. This project is estimated to bring an additional 450,000 permanent jobs to California by 2035 as a result of economic growth. The California Community Foundation (CCF) aims to create greater equity, opportunity, and prosperity in Los Angeles County. Established in 1915, CCF currently stewards nearly $1.4 billion in total assets and manages more than 1,700 charitable foundations, funds, and legacies. From 2003 to 2013, CCF made almost 62,000 grants totaling $1.6 billion, representing, on average, 10-20 percent of its assets annually. CCF also has a PRI program, through which it provides low-interest loans to Community Development Financial Institutions (CDFIs) and intermediary lenders that can leverage additional financing and provide technical assistance to local nonprofits. To date, this program has made more than 90 loans totaling $21.6 million, creating 4,507 units of affordable housing and more than 300,000 square feet of community facility space. Founded in 1996, the East Los Angeles Community Corporation works to preserve neighborhood assets and strengthen existing community infrastructure in Boyle Heights and Unincorporated East Los Angeles. The group develops affordable housing, provides financial literacy and first-time homebuyer programs, and other community services. The CDC’s achievements include leveraging over $135 million of investment for the Eastside, providing affordable housing for over 1,000 residents, and helping over 3,000 families purchase a first homes, avoid foreclosure, establish savings, and build and sustain community wealth. Founded in 1989, Esperanza Community Housing Corporation develops affordable housing, promotes accessible health care, and pursues economic development in the Figueroa Corridor neighborhood of South-Central Los Angeles. Its Community Health Promoters’ Program trains bi- and trilingual low-income residents to become community health leaders, who better understand community needs and have marketable skills for further employment. To date, the CDC has also completed nine affordable housing projects that provide a total of 165 housing units. In developing Mercado La Paloma, the group has helped create 15 businesses, 80 jobs, and a community-gathering place. Founded in 1979, the Little Tokyo Service Center (LTSC) serves Los Angeles County’s Asian and Pacific Islander populations experiencing language or cultural gaps, financial need, physical disabilities, or other challenges. To do so, it sponsors over a dozen different community and social service programs and partners with other nonprofit organizations on community-serving real estate projects. Through such collaborations, LTSC has helped develop 800 units of affordable housing and approximately 125,000 square feet of community space, totaling more than $200 million in investment. It is also working in partnership with over 100 organizations to create “Sustainable Little Tokyo,” a cultural eco-district that will sustain LA’s Little Tokyo for future generations by embracing green technologies and infrastructure, growing small businesses, and supporting Japanese and Japanese-American arts and culture. Initially funded through federal legislation, TELACU is one of the largest minority-focused community development corporations in the United States. TELACU Community Capital, one of its subsidiaries, operates as a Community Development Financial Institution, providing special financing and technical assistance to nontraditional small business owners. The parent CDC owns a number of business enterprises operating within four industries – Real Estate Development, Financial Services, Construction, and Construction Management—that all provide a “double bottom line,” meaning they generate profits for the CDC while creating positive social impact. Thai CDC was established in 1994 to provide culturally and linguistically appropriate social and human services for economically disadvantaged Thai immigrants. Today, the CDC aims to create a thriving community by creating businesses and jobs, developing decent and affordable housing, and revitalizing public space. Its achievements include the development of 106 housing units for low-income people and a $1.3 million streetscape project in “Thai Town,” a designation that the CDC helped win for a depressed, neglected section of East Hollywood as a way to promote neighborhood pride, economic development, cultural exchanges, and tourism. The CDC is currently working to develop Thai Town Marketplace, a social enterprise business incubator that aims to create living-wage jobs and economic self-sufficiency for ethnic entrepreneurs in the East Hollywood area. The project is expected to provide 19 business start-up opportunities and create at least 38 permanent jobs. Founded in 1980, Cooperative Resources & Services Project (CRSP) is a nonprofit that provides resources and support to cooperative and ecological neighborhoods, eco-villages, and intentional communities. In 1993, it created the Los Angeles Eco-Village (LAEV), an intentional community with about 40 residents committed to living more ecologically and cooperatively. Today, it continues to support LAEV, in part through its Ecological Revolving Loan Fund, which helps finance the acquisition and ecological retrofitting of property within the LAEV and provides loans to small, green, cooperatively-oriented businesses started by LAEV members or those affiliated with other CRSP initiatives. Founded by the City of Los Angeles to accelerate the commercialization of clean technologies, LACI is a nonprofit that offers flexible office space, CEO coaching and mentoring, and access to a network of experts and capital. Incubated companies operate in a range of sectors including Smart Grid infrastructure, energy efficiency, energy storage, electric transportation, and materials science. Working closely with area universities, businesses, governments, capital markets and utilities, LACI aims to foster innovation and grow the region’s green economy. Over the next five years, LACI expects to help create 1,600 direct and indirect jobs. Based in Los Angeles, LURN is a nonprofit that works to catalyze multi-disciplinary collaborations focused on designing, building, and promoting sustainable communities in which people can live to their greatest potential. To do so, it coordinates LURNlabs, purpose-driven innovation labs that bring together diverse people to develop solutions to urban issues. One current LURNlab focuses on the development of an LA strategy to incubate community-based, worker cooperatives. Through its LURNcapital initiative, it also works to increase low-income communities’ ability to access capital. For example, it is currently working to help street vendors who want to sell at farmers’ markets purchase the equipment they need to do so. PACE is a nonprofit community development organization founded in 1976 to address the employment and job training needs of the Pacific Asian Islander communities. PACE has since expanded into a variety of service areas, all tailored to meet the growing and changing needs of the multi-ethnic communities in Los Angeles County. Its Business Development Center, which aims to advance wealth by giving individuals the tools to develop sustainable businesses and successfully manage their personal finances, is credited with serving 113,873 low-income people and 10,237 businesses, leveraging over $50 million, and creating or retaining 14,142 jobs since 2003. Other key programs include job training, employment services, childhood education, housing and rehabilitation services, weatherization and energy-conservation, and affordable housing development. Created in January 2011 by Mayor Antonio Villaraigosa to build a “Good Food system” for all of Los Angeles, the Los Angeles Food Policy Council aims to reduce hunger, improve public health, increase equity, create good jobs, stimulate local economic activity, and foster environmental stewardship. Its work focuses on bringing together leaders and experts from across sectors, geographies, and socio-economic communities to strengthen connections throughout the food system, and to facilitate and coordinate systemic change. One of LAFPC’s key achievements was the development of a Good Food Purchasing Program, the most comprehensive metric-based food purchasing policy of its kind in the nation, which rates organizations’ commitment to sustainable food along five key dimensions and provides technical assistance in sourcing, monitoring progress, and measuring and recognizing success. The Los Angeles Department of Water and Power (LADWP) is the country's largest public utility supplying water and electricity to the city's 3.8 million residents. Each year, it transfers at least seven percent of its electric gross revenues and five percent of its water gross revenues to the Los Angeles General Fund, helping finance city police and fire protection, as well as recreational facilities. Committed to green practices, LADWP is also constructing and operating solar photovoltaic (PV) systems on its facilities and municipal buildings, and offering incentive payments to encourage the development of residential and commercial solar systems. Launched in 2008 as a joint effort of the Office of the Governor, the Office of the Mayor, the California Department of Consumer Affairs, the Federal Deposit Insurance Corporation, the United Way of Greater Los Angeles, local financial institutions and community-based organizations, Bank on Los Angeles aims to connect Los Angeles’ unbanked and under-banked populations to low-cost financial products and services and expand access to financial education. To do so, participating banks and credit unions created low and no-cost products targeted toward first-time and “second chance” clients, expanded outreach strategies in low-income neighborhoods, and developed community-focused financial management training. Participating community-based groups added financial education, free tax preparation, and other asset building programs to their program offerings. To date, Bank on Los Angeles is credited with helping to open over 56,500 bank accounts. Founded in 1996, SAJE aims to make Los Angeles a happier, more just place. To do so, it focuses on changing public and corporate policies in ways that can provide concrete economic benefit to working-class people, increase the economic rights of the working class, and build leadership through a movement for economic justice. 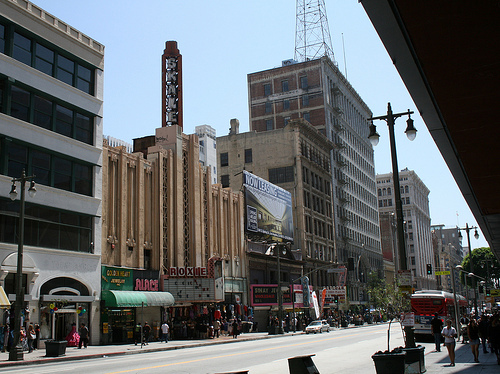 Its achievements include the first-of-its-kind Community Benefits Agreement with Anschutz Entertainment Group (i.e., the owner of Staples Center and L.A. Live), which stipulated the hiring of neighborhood residents at a living wage, and the conviction of a record number of slumlords in partnership with the City Attorney. SAJE also runs the Figueroa Corridor Community Jobs Program, which provides low-income community residents with training in the hospitality industry and building trades and helps ensure they can access better jobs with higher wages. Since 2004, the program has assisted over 600 local residents. In 1992, USC President Steven B. Sample started five initiatives that focused the University on improving the surrounding neighborhoods. Today, the USC invests $35 million annually to support community initiatives, which serve 40,000 area residents. Its efforts includes the USC Neighborhood Academic Initiative, an intensive college prep program that sends 100 percent of its students to college with nearly half getting full-tuition scholarships to USC; the Family of Schools program, which supports 15 neighborhood elementary, middle and high schools; and business programs credited with helping 60 small business owners obtain $61 million dollars in capital, contracts and loans. Moreover, its local hiring initiative is credited with funneling $5 million in annual salaries back into the neighborhood.